We hereby kindly invite you to join us for our international workshop on work-based learning at Bonn Science Shop in Bonn, Germany. The focus of the event will be on Soufflearning, an innovative and proven concept for vocational training in SMEs. The workshop is aimed at stakeholders from the area of vocational education as well as representatives of small and micro enterprises. It will be a great opportunity to hear more about an innovative training methodology and proven approach for work-based learning as well as network with peers, trainers and VET institutes from all across Europe. The workshop will discuss results from three different iterations of Soufflearning, two of which were Leonardo da Vinci Transfer of Innovation projects. 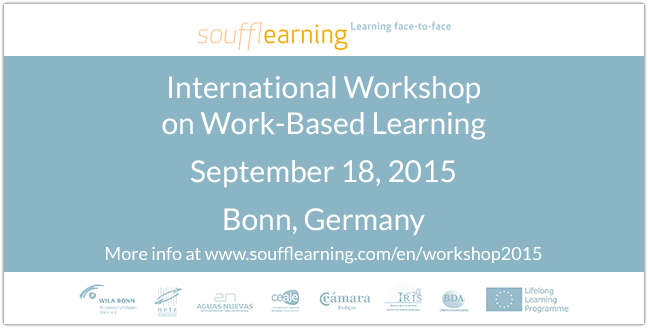 From Innovation to Cooperation – What is Next For Soufflearning? What kind of international, national or regional cooperation is required? Experiences and input from workshop participants. Do we need an organizational structure to capture and validate existing experiences on work-based learning? What could be objectives for a future network/cooperation structure? Recommendations and suggestions for future strategies from Soufflearning project consortia and participants to further facilitate innovative approaches for work-based learning. Attendance is free of charge. Drinks, coffee and a light lunch will be provided during the workshop. If you or your organization would like to participate, please contact us via the contact form below. You can use this site to learn more about the Soufflearning methodology and accompanying project as well as through the official ADAM database.